Last week, the National Anti-Vivisection Society UK and Animal Defenders International US released horrific undercover footage of abuse and suffering of monkeys at the Biodia monkey farm in Mauritius. Not only are these animals bred in factory-farm conditions, but also due to the failure of captive breeding, they are continuously taken from the wild, inevitably causing unbalanced populations and therefore wider environmental damage. The monkeys are exported all over the world, including to the US and the UK, two of the world’s largest markets for monkeys – despite the increasing availability of alternatives and public and political support to restrict primate use in research and end the use of wild-caught primates. Screaming, baby monkeys were torn from their mothers’ arms and pinned down to be tattooed as their distressed mothers looked on, helpless to protect their babies. Terrified monkeys were netted and slammed onto concrete floors and wrenched from cages by their tails. 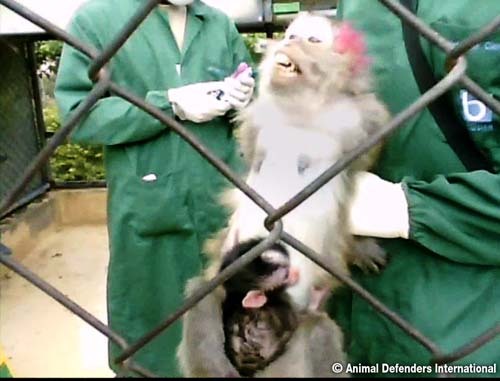 Frightened and distress, monkeys were clamped down and injected into the eyelid for TB tests. Some of the footage shows workers actually swinging the monkeys by their tails with the animals unable to control how they landed. The barren, crowded cages, with broken families and deaths and injuries from fighting due to cramped, deprived conditions, makes this a hell on earth for these intelligent, emotional and sensitive primates. 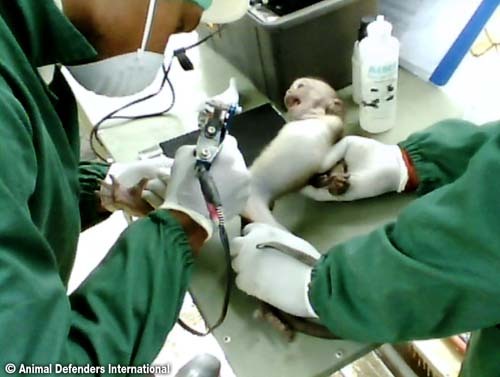 Shipped thousands of miles to laboratory customers the terrified monkeys spend hours in tiny boxes, alone, fearful and distressed, and many die or become sick on the journey. Air France & China Southern are the last remaining passenger airlines to fly monkeys destined for laboratories.